More than 18 million U.S. adults and 6 million children have asthma, a chronic lung disease that inflames and narrows airways and causes recurring wheezing, chest tightness, shortness of breath, and coughing. How and why Big Pharma jacked up prices for one of the common treatments for this disease tells a key story of not only the difficulty in controlling skyrocketing drug costs but also drug makers’ willingness and capacities to exploit an affliction that costs the country more than $56 billion annually and hits hard at the young, poor, minorities, and the under- or un-insured. Good Rx, a website led by three technology entrepreneurs who say they want to help Americans with soaring drug costs, deserves credit for reporting on its blog the story of asthma inhalers, and how Big Pharma has kept pushing ever higher the price for them. The site says it followed up a five-year-old New York Times dig into “The soaring cost of a simple breath.” Good Rx says prices have only worsened, climbing 35 percent since, making inhalers just a little less than $400 on average, while some have gone up 41 percent or 56 percent in cost since 2013. As the New York Times noted before, Albuterol, the drug basic and central to many asthma-treating devices, cost around $15 in the 1990s before Big Pharma started to exploit patent and environmental laws to make inhalers nose-bleed expensive. Around 2005, by international treaty, environmentalists pushed to reduce the use of chlorofluorocarbons, aka CFCs, which were found to destroy the earth’s protective ozone layer. This greenhouse gas, until it became subject to global controls and bans, once was used as a common coolant in all kinds of refrigeration equipment. Tiny amounts of CFCs were used as aerosol propellants, and were a part of asthma inhalers and had been allowed. But, as the New York Times and Good Rx have pointed out, Big Pharma lobbied hard to end this exemption, pushing regulators and consumers to make a big switch to inhalers using less environmentally damaging hydrofluoroalkanes (HFAs). Before saluting Big Pharma for being keen and green, it’s worth noting that drug makers used the propellant change to re-patent key elements of inhalers. The drugs in them didn’t change, or they simply were combined in ways that hadn’t been done before. The devices didn’t change, just the propellant did. But Big Pharma, in effect, won a raft of new legal rights and protections for this product ─ and sent prices through the roof, a scheme akin to Detroit re-pricing its cars just because their gasoline formula changed. Among the casualties in the change, Good Rx reminds, was the over-the-counter med used by millions: Primatene Mist. Now, those with asthma have fewer, much more costly choices for treatment that millions rely on to deal with bursts of coughing, wheezing, and shortness of breath, shy of seeking even more costly and extensive medical interventions. Here’s more of the Big Pharma gouge for asthmatics: Drug makers keep the price of inhalers just at a point where patients get stuck with the bulk of their costs, whether due to high deductibles, or formularies ─ lists of drugs that insurers, employers, pharmacies and other middle people deem as “acceptable” drugs for coverage. Fight through all the complexities of health insurance, drug pricing and distribution, and it comes to this: Asthmatics under- or un-insured face daunting costs for inhaler. The price inequity affects minorities and the young acutely ─ not the least because their condition is worsened by exposure to “triggers,” including reaction to vermin (rats and roaches), dust, and dirt that is all too common in run-down housing in which they live. 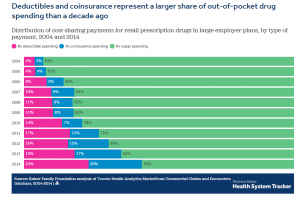 The pile-up of circumstance ─ aka the cost exploitation by Big Pharma, insurers, employers, pharmacies, and the rising middle-men known as pharmacy benefit managers (PBMs) ─ vexes not just the poor, of course. More Americans, notably those who get health insurance through work, are taking coverages with higher deductibles, in exchange for lower premiums. The New York Times reported how this can result in harsh trade-offs, for example, with women with breast cancer and high-deductible coverage delaying treatment ─ and saving some money while potentially worsening their disease. 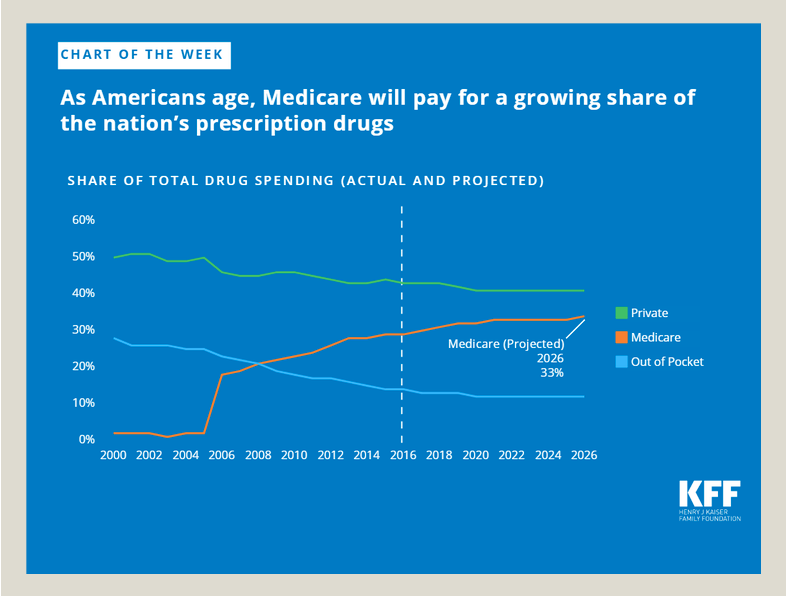 High-deductibles, particularly in employer-provided health policies, also means sharply rising numbers of patients get exposed to major headaches with ever-increasing prescription drug prices (see chart above). That’s because they’re bearing these themselves as out of pocket costs, and at greater rates than ever before, research finds. 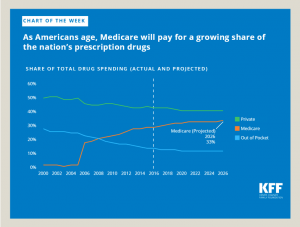 Further, as the nation keeps graying at a faster and faster pace, the federal government ─ via Medicare and Medicaid ─ is seeing its drug costs head north (see chart above). Generics? Although Good Rx finds some promise here, Bloomberg news service describes why this option hasn’t worked robustly for asthmatics, either, with a major drug firm retaining a strangle-hold on a key and common inhaler. In my practice, I see not only the huge harms that patients suffer while seeking medical services but also the major struggles they experience in accessing and affording safe, quality, and excellent medical services, including getting medications that aren’t dangerous and that will not bankrupt them. Big Pharma’s relentless ploys to boost prescription drug prices are unacceptable, and patients are desperate for political and regulatory leadership to attack this complex nightmare. President Trump has blustered on the topic but still has not acted, nor has he led an effective campaign against high drug costs (he is scheduled, yet again, to talk about the topic). [Gottlieb] suggested that a key federal law on kickbacks could be reinterpreted by the government to help rein in the prices of prescription drugs. Drug companies are currently being sued by lawyers who believe that the Byzantine system of rebates that flow between pharmacy benefit managers, drug manufactures, and insurers are really kickbacks. The current interpretation of the federal law shields these rebates from legal scrutiny. But Gottlieb, in remarks delivered at the annual conference of the Food and Drug Law Institute, signaled that might change. To be sure, the commissioner has said popular sounding things since getting in office, without necessarily being so quick to follow them up. And the anti-kickback law would be an aggressive way to deal with drug prices with a criminal statute. But prosecutors may look at how Big Pharma keeps choking consumers with unacceptably high prices and find action may be warranted.